Recently I got an offer in the form of gift coupon from one of the affiliate of ibhejo.com to review their site. I should say the choices were abundant and the purchase was a breeze. Having and catering through ecommerce site is a big challenge with so many leading sites in this domain, one needs to be quite unique to standout and get noticed by the customer, the uniqueness of ibhejo.com is we can directly shop things from US and get it delivered to our home without much worrying about the hassles of Customs and other stuff that are involved in International shipping. 1.to send to someone; to deliver a package. Bhejo, LLC. is a registered corporation in the United States. Like our name suggests, we specialize in procuring products from the U.S. and delivering them directly to consumers based in India. We offer customers in India a simple and efficient way to purchase products not normally available in India. We are committed to serving you with the best prices and fastest delivery possible. Our customer service center is located in Mumbai, India and are available at the above times to handle your queries. 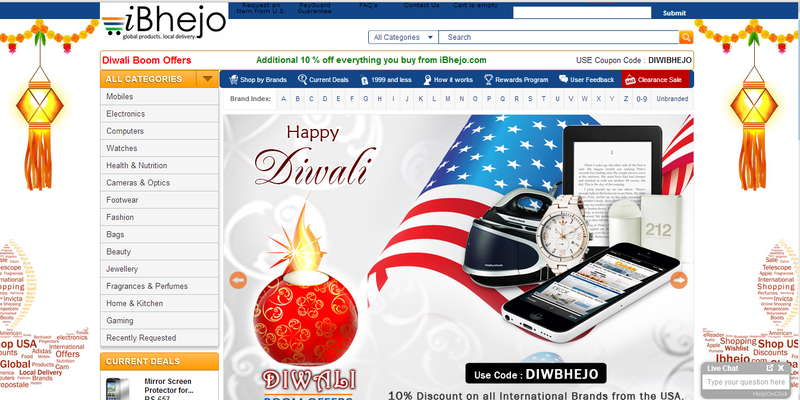 Where ibhejo differs from two of the worldwide leading ecommerce sites – Amazon and eBay who also have their sites catering to Indian customer locally is you don’t have to buy things like American made designer watches and consumer electrical products like mobile phones from their US sites and get it delivered to India which will involve international shipping charges and customs fees which are all calculated and paid at the time of placing the order . One will never be happy to see the exorbitant amount that are involved and in worst case the item may even get stuck in Customs and will never get clearance and reach our hand, but with ibhejo you can be confident that the amount they are charging are quite nominal compared to other sites and importantly we don’t have to worry about the product not getting clearance from Customs or getting charged additional amount from what we have already paid for Customs clearance. The great thing about ibhejo.com is that you can buy stuff that are not meant for Indian market, to give you an example the very famous Google Nexus 7 2nd generation Tablet from Google is not yet launched officially by Google in India, this is where ibhejo comes in to play, you can find same Nexus tablet in iBhejo.com and place the order and get the product delivered in maximum of 10 days’ time, now this is what called true International purchase as you are getting hold of a great product which is not even released in India by paying nominal additional amount for shipping and Customs fee. They have awesome collections of beauty and cosmetics products too, which we alway hankering for. Do check and enjoy your custom and tension free US brands shopping. :) will def pick sm gadgets from this site rads:) but..no makeup!! sounds interesting - I'll check it out in the evening! though the site may be good as u say.. the price of make up is ridiculously high.. nt a big fan!!! I have the samsung flip cover and love it. I just checked the website out Radha! Seems like a decent service!